SAN DIEGO, Sept. 4, 2018 /PRNewswire/ -- Verimatrix, a specialist in securing and enhancing revenue for network-connected devices and services, today announced that long-standing customer Com Hem has upgraded to Video Content Authority System (VCAS™) Ultra to provide pay-TV security for a ground-breaking deployment. Built on the Android N (Nougat) operating system, the brand-new set-top box (STB) is being rolled out to Com Hem's 1.4 million subscribers for cable, terrestrial, IPTV and OTT delivery. Content for all services across these three networks and screens is secured end-to-end by VCAS Ultra, which ensures that UHD/4K content security meets or exceeds the MovieLabs specification for Enhanced Content Protection. 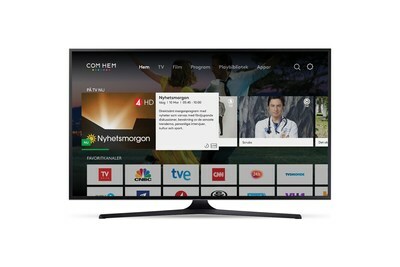 "Android TV presents a very different and a very particular challenge compared to the closed environments of traditional STBs, so it was critical for us to work with a security provider that could deliver an end-to-end solution to resolve any and all of our security concerns," said Thomas Helbo, CTO, at Com Hem. "Having relied on the VCAS framework for multi-network security for several years, we are very confident to reinvest in Verimatrix and have complete trust in its next-generation platform to support this truly pioneering deployment." VCAS Ultra harnesses a Trusted Execution Environment (TEE) inside the STB's system-on-chip (SoC) and includes security clients for the IPTV and cable networks for which Com Hem operates. Optional robust forensic watermarking ensures complete content and revenue security for Com Hem and its content providers. "Com Hem had an ambitious vision of offering its customers virtually unlimited choice in accessing and viewing video content, and VCAS Ultra provides the precise technology needed to support the different delivery methods, extend subscriber reach to UHD/4K services and protect the content in accordance with the latest industry standards," commented Steve Oetegenn, president of Verimatrix. "As Com Hem continues to grow and innovate its service offerings, it can rest assured that the flexible and scalable VCAS framework will consistently keep pace." To learn more about world's first large scale Android N (Nougat) pay-TV deployment based on Android TV Operator Tier and how Verimatrix enables Com Hem to offer unique UHD/4K hybrid services, download the case study. Verimatrix specializes in securing and enhancing revenue for network-connected devices and services around the world and is recognized as the global number one in revenue security for IP-based video services. The award-winning and independently audited Verimatrix Video Content Authority System (VCAS™) family of solutions enables next-generation video service providers to cost-effectively extend their networks and enable new business models. The company has continued its technical innovation by offering a comprehensive data collection platform, Verspective® Analytics, for automated system real-time quality of experience (QoE) optimization to drive user engagement and content monetization, and data collection/analytics and Vtegrity™, advanced security that addresses IoT threats and service lifecycle management.